Good Morning! It's Friday! This week was great. I love four day work weeks....it would be better if all weeks were four or three day work weeks! Wishful thinking. This Friday I bring you a recipe that is perfect for Sunday mornings with your cup of tea and newspaper. Hopefully you know me by now and you know that I love to bake, but I love to bake recipes that are very simple. I found this recipe a while ago online and have been wanting to test it out. I will forewarn you- online the picture is nothing like what the recipe tells you to do. I think Duncan Hines needs to evaluate their site. 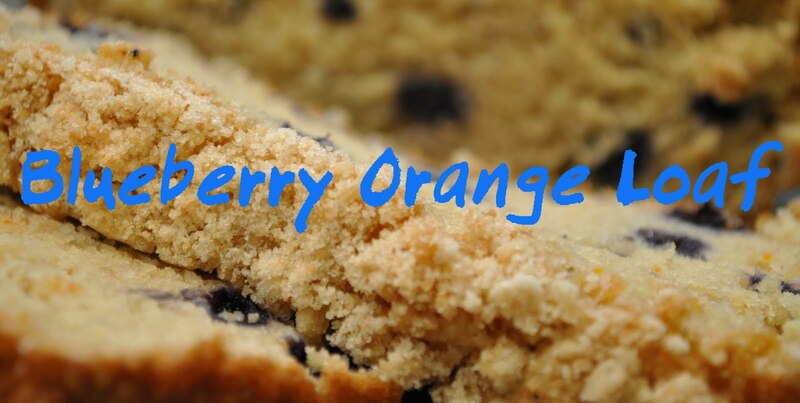 So here it is- Blueberry Orange Loaf. Five ingredients needed and I'm pretty sure you have four of these in your kitchen now. The only item I had to buy was the Blueberry Streusel mix the recipe calls for. Let's start- preheat your oven to 350°F and grease a 9x5 inch loaf pan. You'll want to then take the container with the blueberries out of the box and rinse and drain. No mixer is needed for this recipe- you'll want to stir by hand. Mix muffin mix and baking powder together in a bowl. Then add orange juice and two egg whites. Mix together till smooth. Then gently fold in blueberries and 1tsp orange peel. Sprinkle with toppings packet and bake for 45-55 minutes, or till toothpick comes out clean. Cool in pan for 10 minutes and then transfer to a cooling rack till completely cool. Enjoy! For the full actual recipe with measurements and to print click here for the Duncan Hines site. The best part of making this recipe is that your whole house will smell like blueberries. I had a slice this morning for breakfast and it was super yummy and really moist. I think next time though I might use a little more orange peel or orange juice for a lil more zest. Let me know what you think of the recipe if you try it. I need your input please-do you like Food Friday? Should I continue to do it or would you prefer it to be once a month? Let me know please. PS- Have a recipe you think I should try out or do you have a recipe you want to feature on my blog on Food Friday? I would love to have follow readers become guest editors/contributors to my blog. Just shoot me an email here and let me know! I totally agree, we need 4 day work weeks all the time! And I love Food Fridays! food and fashion to great passions! Even though I don't always comment on FF, keep it going, it's superb!